Please note that prices will reflect all eventual discounts as soon as you are logged on. While saving of energy became the main purpose across the globe, for Europe there is a challenge to reduce harmful emissions to atmosphere by 20% by the year 2020 as compared to those of 1990. As far as energy conservation is concerned, the maximum potential related to worldwide railway sector lies with the European Union, the USA, Japan, Russia, India, and China. In 2013, these countries together provided 89% of passenger-kilometers and 84% of tonne-kilometers of global traffic volume . Being among the largest energy consumers in Russia, railway transport consumes 5% of electric energy and about 11% of diesel fuel. In modern conditions, energy efficiency is one of the principal factors helping to improve the Russian Railways market competitive abilities in transport service industry. As compared to transportation by road or air, that by railway is less energy-consuming in both freight and passenger traffics. Major part of fuel and energy resources (FER) is spent on train haulage, and for this reason the initial measures to improve energy efficiency should be taken in this particular sector. 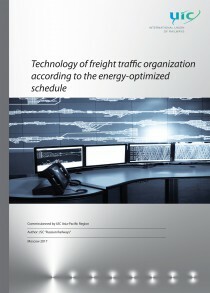 Analysis of the Russian Railways Energy strategy implementation disclosed the difference in levels of the impact the units and facilities engaged in rail traffic have on its energy efficiency. The principal activities in this field are those performed by traffic management department and locomotive economy department; they give 60-70% of FER economy for electrical haulage and 70-80% of that for diesel operations. And while for electric haulage the locomotive economy inclusive of repair units is responsible for 15-20%, diesel operations give the principal share of 60-65%. The other parts of energy efficiency are provided by electric power supply department (10-15%), roadway and structure department (9-10%), and car department (5-6%). These data allow ranging the participation levels and fund focuses for the measures to be taken by the departments to save energy and improve energy efficiency . Railway Handbook 2016: Energy Consumption and CO2 Emissions Focus on Sustainability Targets. (http://www.uic.org/) [Online]. The Energy Strategy program of the Russian Rail-ways Holding for the period until 2020 with further exten-sion for the period through 2030. Confirmed by the Russian Railways Order No. 2537r dated 14.12.2016.